Althea Gibson was the first African-American woman to achieve major athletic fame, and the world’s first woman of color to compete and win, at England’s Wimbledon. She was named Woman Athlete of the Year by the Associated Press in 1957. 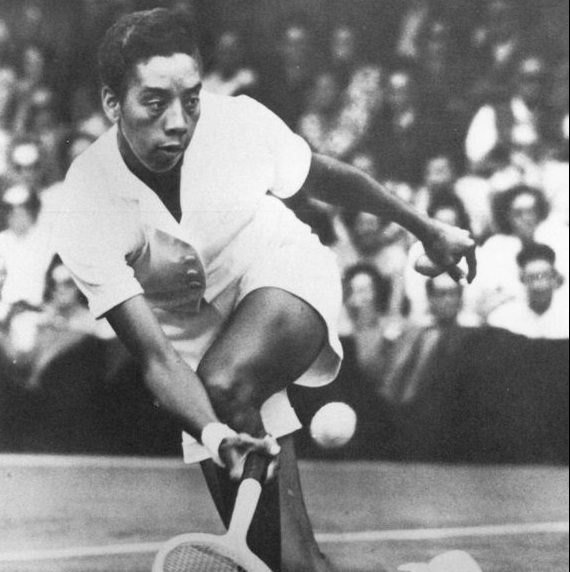 In 1958, Gibson won the American Tennis Association’s women’s championship and the U.S. national singles titles. A 1953 graduate of Florida A&M University in Tallahassee, Gibson was born in South Carolina and grew up in Harlem. Overcoming difficult personal circumstances and drawing on a burning desire to excel, Gibson developed a phenomenal athletic ability. She got her start by winning the 1942 girls’ singles New York State tournament sponsored by the all-Black American Tennis Association. The U.S. State Department sponsored Gibson on a tour of Southeast Asia, where she won other titles. Gibson retired from professional tennis in 1959 at age 32, and then played professional golf for another decade.